I shall certainly be popping into rehearsals every so often and hope to tease further feedback and insight from Annie, cast and crew as the weeks pass by and, ultimately, look forward to joining some of you in the audience for this one. 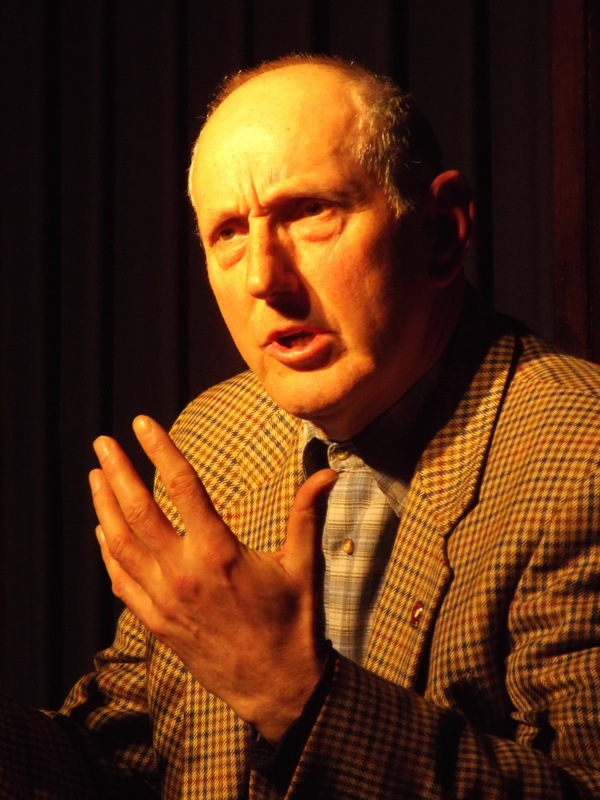 I’ll be posting some more photos from past productions in the forthcoming days in a bid to swell the archive and provide a few reminiscences of plays gone by but til then, have a good one. Yes, rub your eyes, it is advert for a non-Matchbox play( although it is a two way thing and we will be able to use the BLT Facebook page to advertise Matchbox productions in future). Anyway, if you have been following my posts on the main site you wouldn’t have to be a consulting detective to work out I have been doing some bits and bobs for Bromley Little Theatre and will be appearing in this production of ‘The God of Carnage’ over the next week or so. You might be able to guess which character from the poster…not too difficult! It is an Olivier and Tony award winner and was recently made into the award-winning film Carnage directed by Roman Polanski with Jodie Foster, Kate Winslet, John C Reily and Christopher Waltz. A jet black comedy it is wickedly funny with a little deep discomfort thrown in and at a punchy hour and thirty five minutes does not outstay its welcome. It would be great to see some of you if you have an evening free. If you are at all interested please let me know via the blog or my email savbloke@hotmail.com and I will organise a ticket accordingly. Right, normal service is now resumed. Will be updating you soon with news of the next church hall production. Til then, all the best and maybe see you in Bromley? …you can click the link on the page to follow the blog and keep up to date with information as it is published? You do now. So why not subcribe? 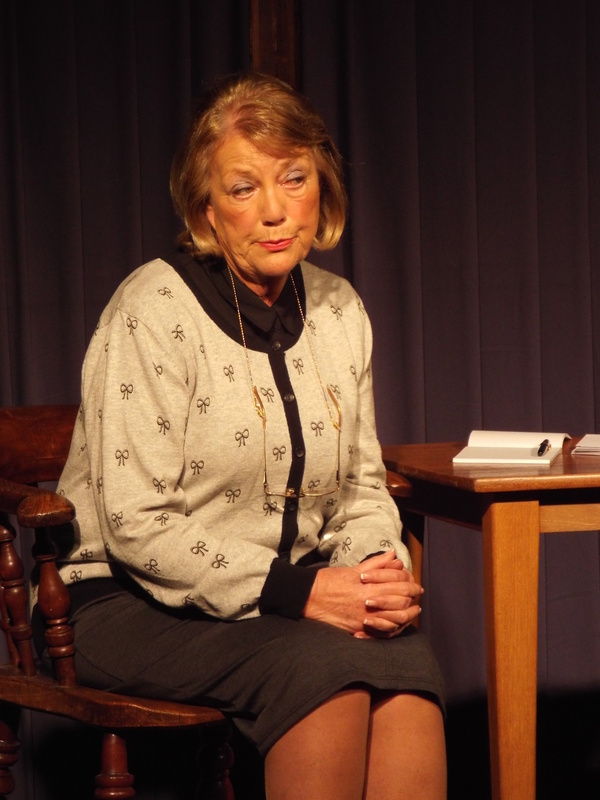 Billed as ‘an informal evening presenting three of Alan Bennett’s best loved monologues’ I was very much looking forward to my Saturday evening excursion to St Francis Church Hall and the latest production from the Matchbox Theatre Group. 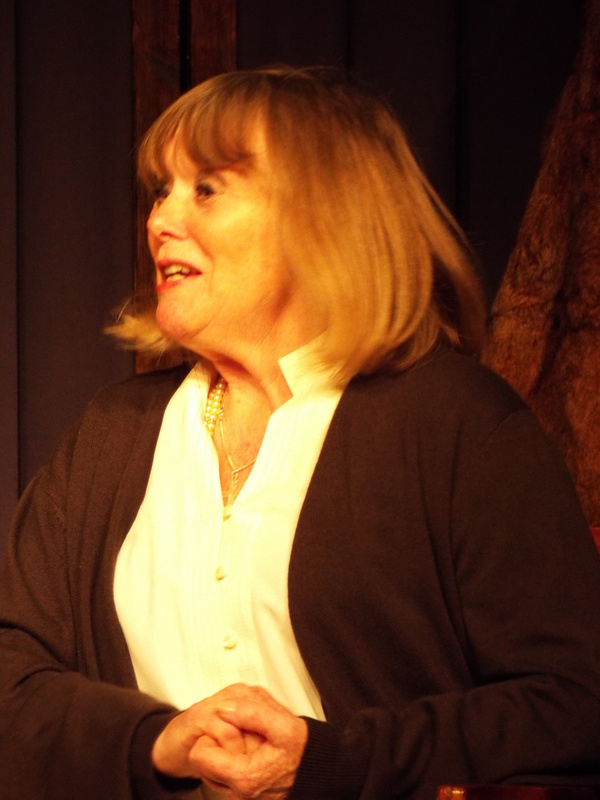 As we were reliably informed at the start by Annie Norris, the Chair and co-director of this play, this was the group’s ninety first production and represented something of a departure from recent pieces. This point was no more clearly established than in the layout of the hall- ranks of seats, some of them raised, arranged around a carpeted stage area in tight formation to clearly provide an intimate experience in comparison to the more spacious arrangements of the previous few plays in the round. The hall seemed a little spare and there seemed more space than usual with only some sixty-odd seats all told. 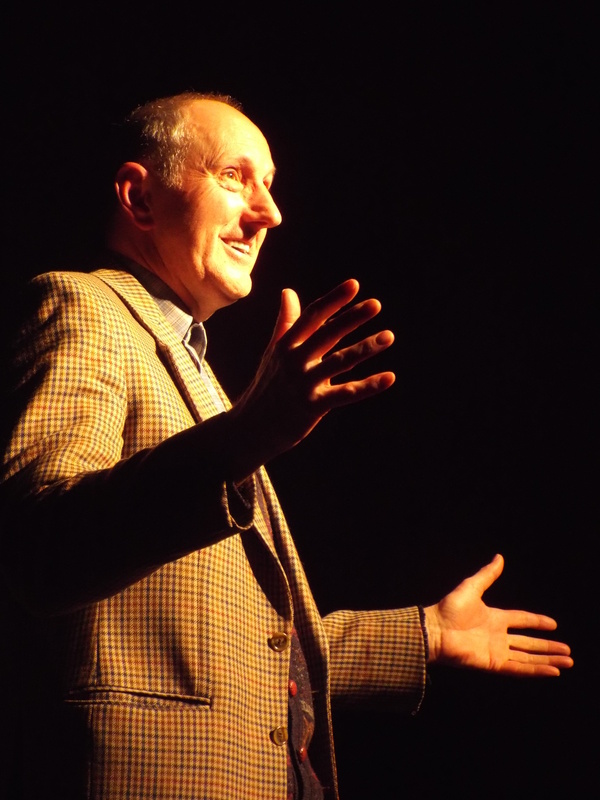 I wondered if, by having restricted numbers, this was a strategy to ensure intimacy and enquired if the play had been running over more nights than usual to allow faces old and new a chance to experience the more personal flavour of these smashing monologues. Mike Savill, the other of the co-directors, informed me that the previous night there had been nearly a hundred souls crammed into the space which must have made for a markedly different experience. It seemed that the audience figures were a little down on previous productions which was a remarkable shame as this was an absolutely first rate night of theatre. The evening began with ‘A Lady of Letters’, the bitter sweet saga of busy body Irene Ruddock- although nobody calls her Irene- a woman not afraid to speak, or write, her mind to remedy the social ills around her. 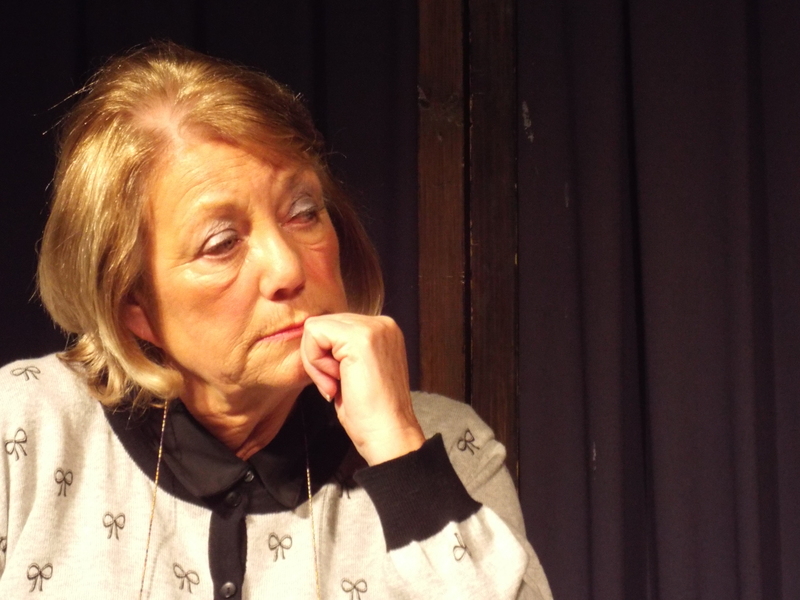 This character was portrayed marvellously by Joan Evans whose presence filled the small stage area from the off. I understand, in my discussion with Mike, that Joan had been very wary of audiences likening her performance to the celebrated rendering of the role on both stage and screen by Patricia Routledge, and had asked that the scene setting music lifted from ‘Keeping Up Appearances’ be switched to the end of the piece so no such expectations were established. This was no bad idea in so much that it could be seen as something of a lazy cliché, but it would have had no bearing at all on Joan’s performance; she made Irene very much her own. Controlled and assured she delivered the humour of Bennett’s words with the confidence of a woman both dominant and yet wonderfully naïve. The scenes of fag smoking hearse drivers, dog dirt issues outside Buckingham Palace and visiting clergy were wickedly evoked by a sincere delivery that made the sketches all the more laugh out loud worthy. Yet, as is the nature of the northern playwright’s work, there is also a more tragic element to many of these tales, and this was handled with equal assuredness by the actress when it came to the revelations about the family next door. It is a tough balance to get but Joan certainly managed it. 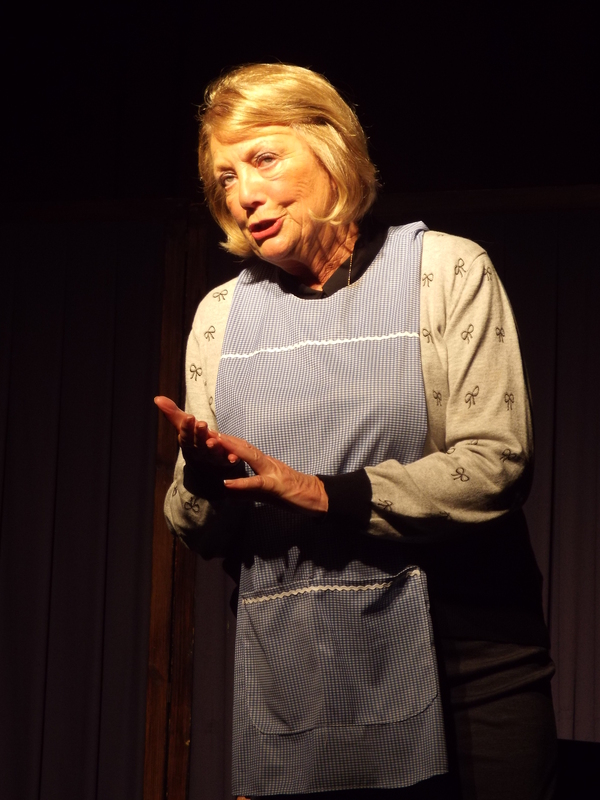 And, of course, when that ‘f’ word came at the end of the play, it brought the house down, just as it is meant to do. I understand it was a first for the Matchbox and came with the vicar’s blessing and bloody right too! It was a perfect punch line for a marvellous performance and great way to start the evening. Second up, following a five minute comfort break, was ‘Soldiering On’. 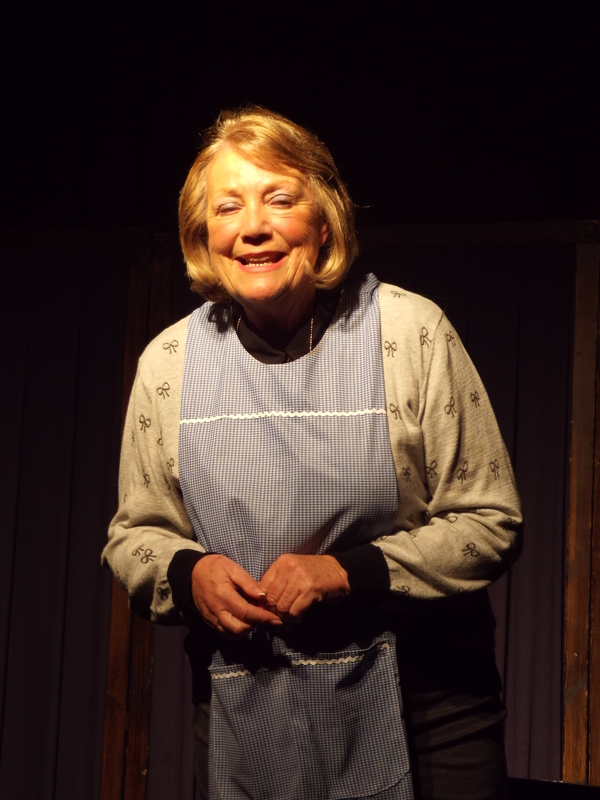 Focussed on Muriel, a recent widow, pillar of the community and all round ‘good egg’, this tale deals with her decline into poverty and loneliness following dealings, sinister or otherwise, of her son Giles. 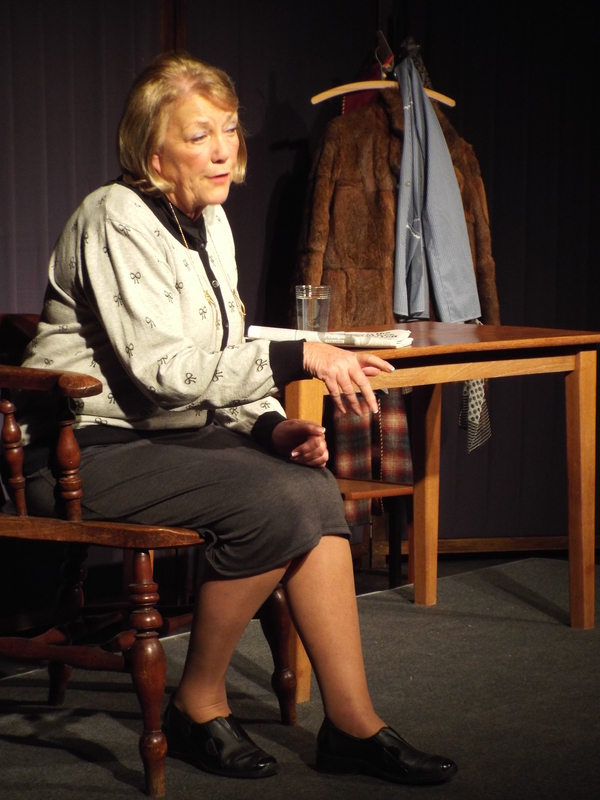 This was a monologue of an altogether different flavour although not bereft of laughs and Dot Pullan, who occupied the role tonight, certainly found them. Nonetheless it is one which is characterised by sombre notes and served as an effective counterpoint to the companion pieces on offer. 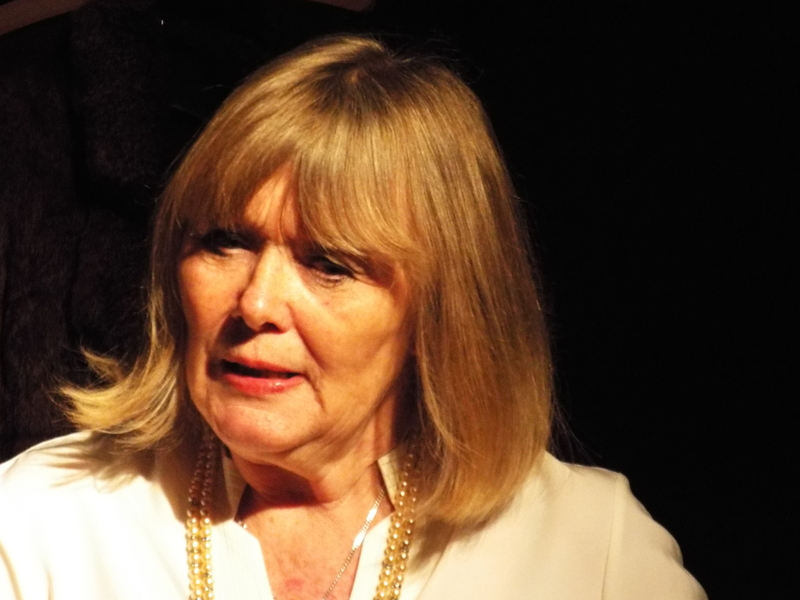 It is quite clear that both actors and directors had worked a great deal on creating believable and sympathetic characters for this evening and Dot offered as confident and assured performance as we had previously witnessed in ‘Letters’ although with a woman whose confidence and assurance was becoming increasingly undermined as the story unfolds. 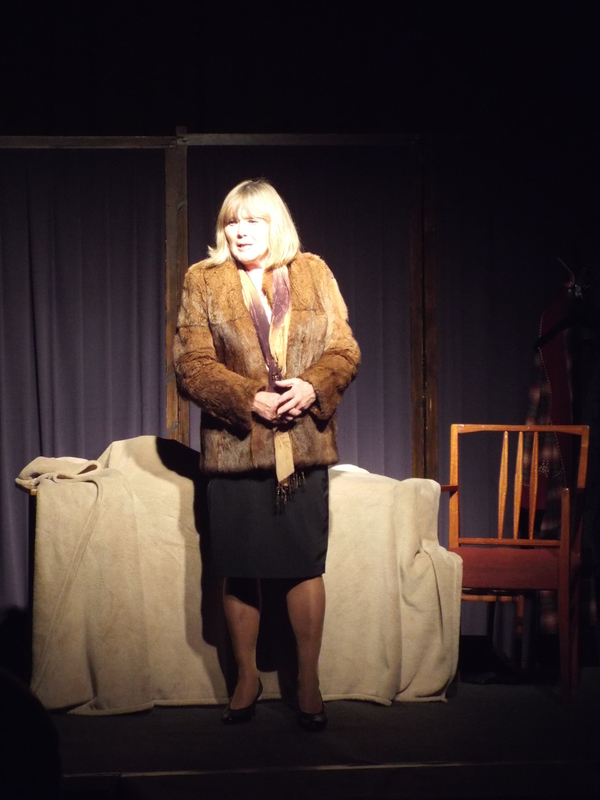 Having seen this actress perform in the past my memories are of a usually more flamboyant and larger than life set of characters from her repertoire and, though there were touches of that in this performance, it was remarkable how controlled and sympathetic she was. I understand that there were a number in the audience who confessed to welling up as the music – was it Strauss? – swelled at the end of the play. If there was perhaps one criticism of this piece I guess it was maybe in the, for want of a better word, faff. In comparison to the sleek minimalism of the other two pieces this evening there were a lot of trinkets cluttering the piece and changes that could have either been balanced out by music or perhaps removed wholly, after all they were not seen as necessary elsewhere. The performance could have carried all and, indeed, proved a reflective lead in to the interval. In a break from tradition tea and coffee were served in the hall and as I talked to my companion and enjoyed a brief encounter with one of the directors and crew- all part of the informal flavour I suppose- I could not agree more with the words in the blog that I had been directed to, this truly represented fantastic value for money for £6 (although I did notice that this marked a one pound increase in the usual price. Not that I could complain, after all people have been paying a fiver for as long as I can recall and that is quite some time now so I don’t begrudge The Matchbox moving with inflation). The final monologue of the evening was the one I was really looking forward to, ‘A Chip in the Sugar’. I know I shouldn’t really be choosing favourites here and this can be left out before these words are published if need be but of all the ‘Heads’ so to speak it is the one that stands out to me. Maybe it’s a male thing and in this body of work that’s a rarity. Not that I would like to compare myself in any way to Graham, the protagonist of this tale about one man and his somewhat eccentric relationship with his mother. 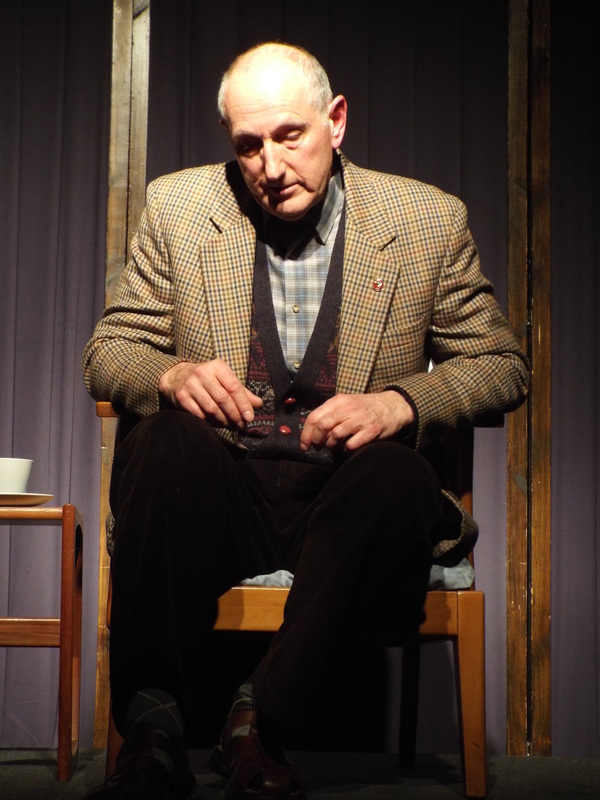 Played by Alan Bennett himself in both the television and theatrical versions, tonight the role was filled by Chris Rutter. And I suppose it’s worth saying here that another standout factor of this evening was the pleasure of seeing actors usually cast in supporting or character roles taking their moment in the limelight and, just as with the ladies, Chris certainly seized his with both hands. 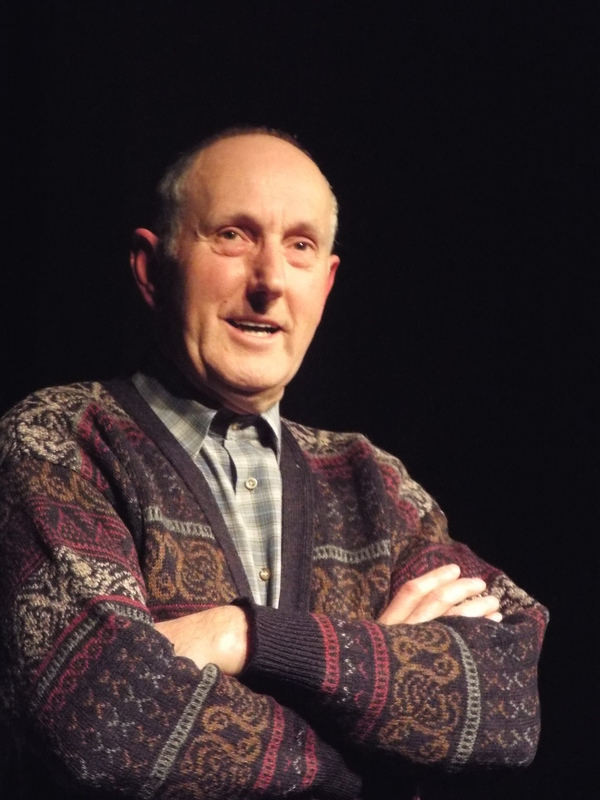 Being familiar with the piece I briefly wondered whether the actor might have been just a little too old for the role but such thoughts were rapidly dispelled by the immediately engaging way that we were drawn into Graham’s world. With deliciously subtle northern twang and definite mannered movements Chris wove a wonderful tale in the conversational style that so characterises these plays which effectively lets the audience into other people’s lives for the thirty five/forty minutes we share with them and then leaves us considering the more subtle undertones and footnotes hidden within their words. It was a great way to finish the evening; Chris’s delivery was hilarious with punch line after punch line being rendered with an understated yet potent sense of comic timing. Yes there were a couple of moments when it seemed like the thread might unravel but it is testament to a strong actor that we were confidently guided back onto track and pulled back into the compelling story that we were privy to. And so it finished; the three performers shared a bow at the end of the show and another production was done and a very successful one at that. 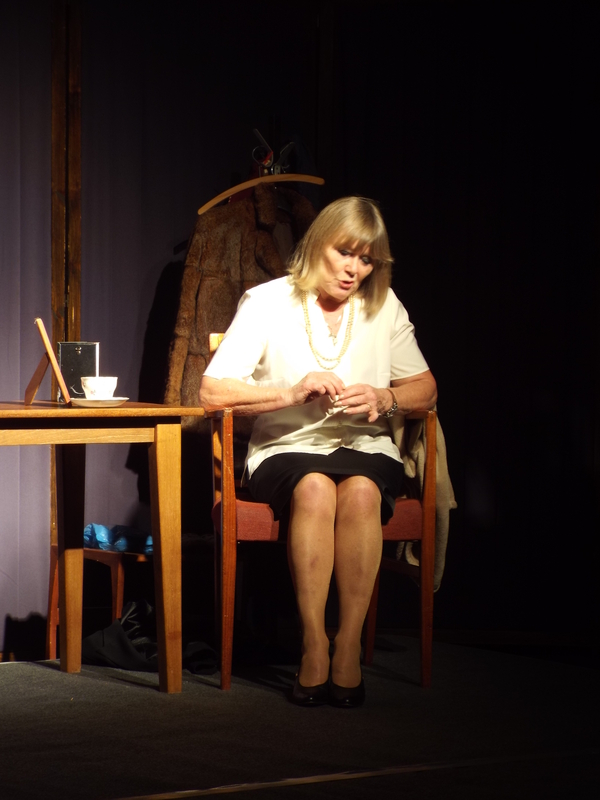 I have been lucky to see a large number of shows over the years and it is very rarely that I leave a night at St Francis church hall disappointed or not feeling thoroughly entertained. It seems just a shame that more people were not able to see this particular show, although it worked well with the sixty or so souls in tonight. It certainly was deserving of a bigger crowd. 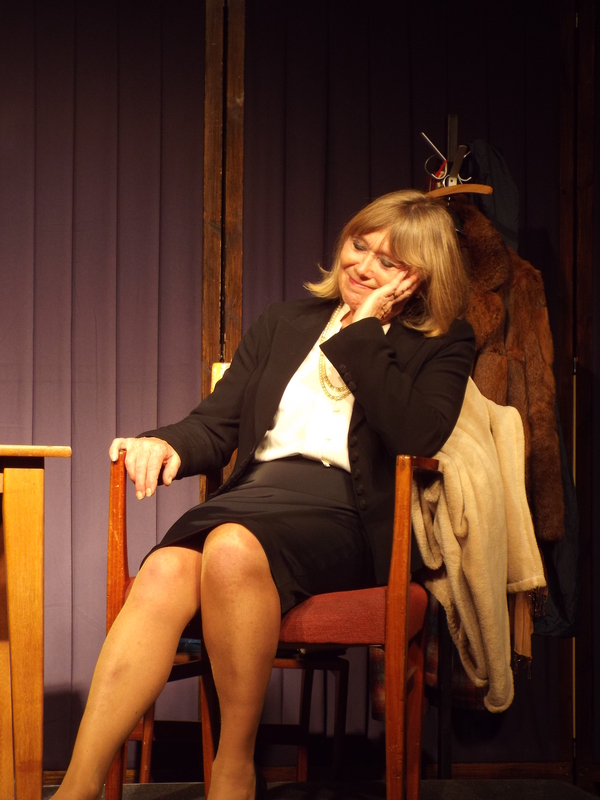 Credit must go to both Annie and Mike whose collaborations drew out three marvellous performances and, though they are not strictly speaking ‘director’s plays’ there can be no question that their work with the actors led to the excellent performances this evening. 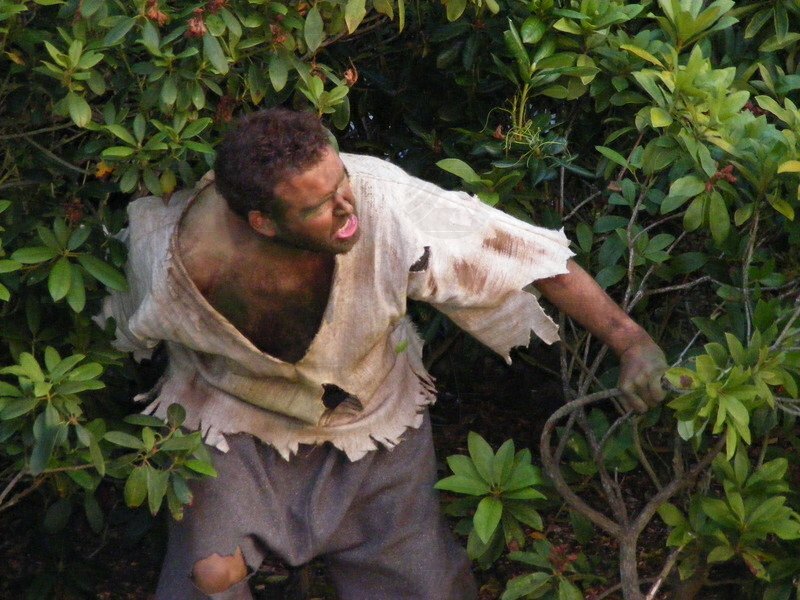 These are also not pieces overly reliant on technical fiddling, at least this rendering wasn’t, but credit should also be passed on to the lighting, sound and stage team who subtly guided the appropriate atmospheres for each of these tales. All in all then another night of excellent theatre and congratulations to all involved. I look forward with enthusiasm to what production number ninety two holds in store; only another nine plays until the one hundredth production it strikes me and that WILL be something to talk about.